Toni Law is my grandmother, or as we young children affectionately came to call her, Nana. When most people imagine their grandmothers or other people’s grandmothers they think of knit sweaters and half moon reading spectacles. When I think of my Nana- when anyone who has ever known Toni thinks of her- we see a very different woman. A blond bombshell, legs that seemingly go on forever, eyes the colour of the true Indian Ocean, green and blue filled with fire and compassion. The woman more beautiful than any 1950’s pin up. Yet, the amazing features of Toni do not solely pertain to her heart wrenching beauty. For those who have had the pleasure of reading my grandparent’s published works than perhaps you have a better insight in to the woman of whom I am speaking. 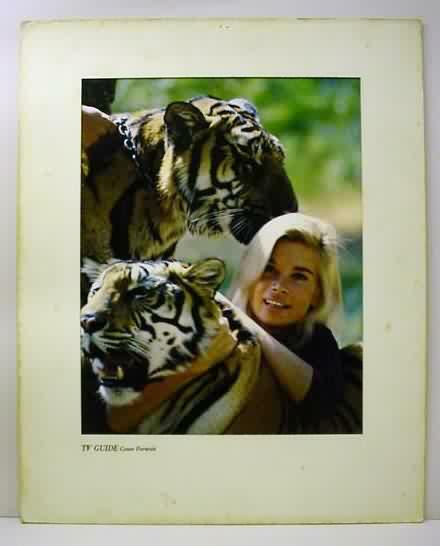 The woman who starred on TV Guide with two tigers framing her striking face. The protagonist in this story is a woman with complexities of the soul and mind, with a history of devotion and single-handed determinedness, with a penchant for generosity and forgiveness, and with an unwavering belief in the good of tomorrow. 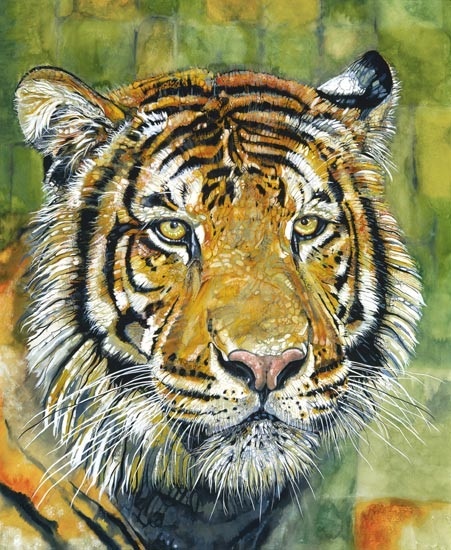 My Nana, with her Supermodel good looks, could educate you on the correct pronunciations of Latin, she could inform you as to which sovereign authority ruled England in any given time, she could paint a tiger that was so life like it would continue to sell for thousands of dollars for three decades after its inception. My Nana could tell you how to hold a laughing hyena, how to get dressed in thirty pounds of American foot ball gear in order to correctly train your lion, how to delicately but firmly remove an immature chimpanzee from your long locks of hair, and all the while she would be quoting Wordsworth, Milton, and the forgotten works of Shakespeare. 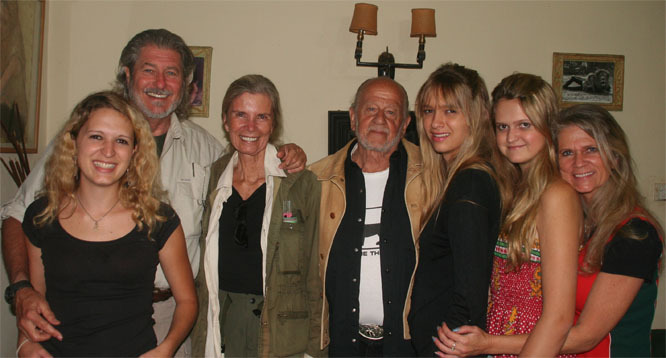 Toni Law has travelled the globe on secret missions, has worked with what the popular culture refers to as Feral Children, has overcome the Himalayas, and has thwarted would be Egyptian attackers with nothing but a Mag Lite torch (in the smallest unexplored vicinity of the inaccessible secret corridors of ancient Pyramids). Toni Law has loved with all of her heart. She has loved a man, a best friend and sister, a daughter, three grand children, and a million people who at some point in their life needed a great woman to love them. She has lost, she has lost greater than any of us could ever claim to know or relate to. Holding on to the infant animals that she could not save while they drowned in the rage of a flash flood. Holding on to her sister as she too passed into the next life. Holding on to the memories of a life that was so unfairly ripped from her grips at the horrendous accusations once made against her first husband (all accusations which I can proudly say were untrue and born from nothing but malice, and lacked any evidence to convince one of otherwise). Toni Law is a woman who not only deserves attention, love, and devotion, but merely demands it through her very presence. She walks into a room and a calm silence and reverie engulfs the inhabitants, all eyes on her. The woman exudes class from every pore in her body, she glides over surfaces and through our lives as the ever virtuous Victorian lady; proper, unwavering, unscathed, untouchable, educated in the Arts and the Science, culture radiating from her core. A seraph of beauty and compassion, an endless sea of knowledge, a thespian of comedy and delight, a reflection of the age of women now seemingly lost. The woman with divine beauty, with unparalleled certainty and education, with delicate propensities to be proper and virtuous, with a command of language and history, and with a fierce pride in her body, soul and mind. It is when I think of my Nana that I feel a great distaste for my generation of women. The girls who wear six inches of nylon and call it a dress, the girls who forfeit education for an easier, more accessible, route. The girls who think the words “I have spread my dreams beneath your feet, tread softly because you tread on my dreams,” is a literal instruction instead of the heart wrenching words of Yeats. The girls who think their grandparents have nothing left to offer them but Christmas cards and inheritance. I defy these girls as I defy my generation’s concern with the past. To be an untouchable woman you must command an audience, you must be learned in the ways of old and new, language and arithmetic, love and body, soul and heart; you must be able to differentiate between realism and post modernism, you must be able to not only tell a humorous joke but know when it is appropriate to laugh. If my idolization of my Nana makes me too traditional to socialize with in this modern era than that is indefinitely fine with me. I challenge any other 20-something girl to find a woman to look up to, to idolize as inspirational, and they will find this weeks’ Hollywood star. I compel you all, women and men, young and old, to find someone who is truly great. Someone who took a firm grip on this world, with all its dark treacheries and delicate beauties and rule, and held on to it tightly, and dominated it into submission, and came out the other side as a woman to be admired. I have loved and I have lost, I am versed in old and new text, I am traveled and I am cultured. I am bilingual and I am attractive. These qualities are ones I am proud of, but they do not make me a woman to admire. For this is just the beginning. I have merely placed my foot into the lake of experience, merely glimpsed over the texts of knowledge, merely begun to take my form as a human. Toni Law has taken life and loved it, learned with it, learned through it. She has set an example of the sort of woman I aspire to be. The sort of woman any girl would be proud to become, the sort of woman any man would be privileged to call his own, the sort of woman who did not drift through the pages of life but really lived. Beauty, class, intelligence, pride, humble graciousness, curiosity, and devotion. Toni Law has not only influenced these traits on to me as her grandchild, but on to any one she has ever crossed paths with, anyone who ever had the luck and joy to be in her presence. I admit I have yet to become the person I will be. No where near the glory of a Champion, no where near the beauty of an Angel, no where near the owner of life for life, I admit, still owns me at times. This is alright; I assure myself and anyone who still feels the same. For we are still transitioning into the person we wish to be, still aspiring to greatness. We will grow, we will change, we will be loved and idolised for a time, and somewhere, someone will have felt touched by us and although the world may forget us that one person shall not.